This seems so remote from the ideas espoused by many of today's radicalized Tea Party Republicans that you might think it's a joke, but in fact it's on the level, part of a collection of political posters housed at Columbia University and available from a web page there. 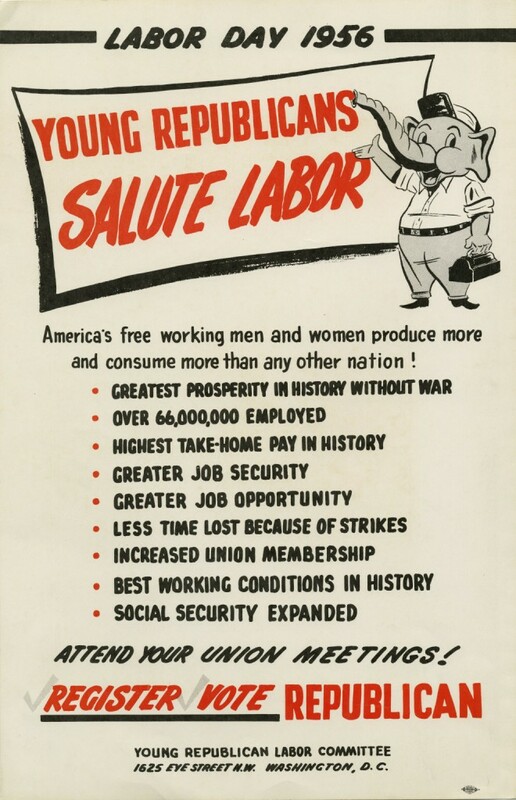 Back then, with President Eisenhower in charge, both parties favored working Americans. The federal income tax was much more progressive than now. The top rate applied only to the portion of income over $400,000 dollars -- about $3.3 million in today's dollars -- and that fraction of one's income was taxed at 91%. Today's top rate starts at a taxable income of $388,351 and does not increase no matter how high one's income reaches. The rate is also far lower, about 40 percent for earned income and less for much investment income. I wish more Republicans would pay attention to traditional conservatives like, say, Ben Stein, rather than the radicals.